Smoking Volcano, originally uploaded by burro come churro. 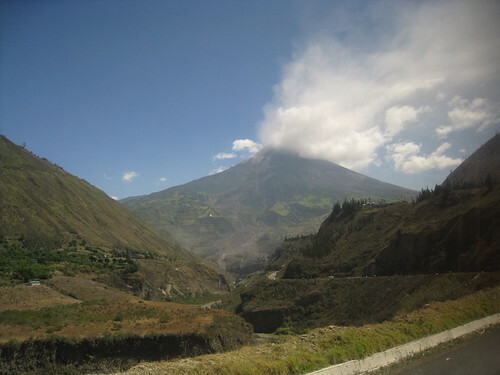 We are on the road to Baños which is near to Quito nestled deep in the shadow of a valley of a gigantic smoking volano. See photo for proof I was there. This is the volcan Tungruahua which was spouting vigorously enough to scare everyone off the mountain a few years back, but slowly people have trickled back as it hasn´t erupted yet. Now it´s a tourist attraction despite the fact it hasn´t been settled weather or not it might blow someday soon. Besides the beauty and awesomeness of a smoking volcano, Baños is really amazingly beautiful and has hot springs to boot. We stayed at a very comfy hostel and ate giant breakfasts and admired the small towns quaint streets. There is a challanging set of stairs that climb the steep jungly slopes up the side of the mountain to a statue of GOD that overlooks the whole place. We went up there, saw him but had to run down to catch a bus but we wished we´d had a few more days to go on a longer hike further up the ridge onto a plateau where there is a little hamlet with farms and cows and other stuff like that. Next time tunguahua unless you haven´t destroyed everything by then - hope not.